OK, all those theories about some weird atmospheric phenomenon causing rains to bypass Midland or dissolve as soon as they get to the city limits sign (ala Wednesday morning's rainless, hard blow) are all forgotten this morning: We've had enough moisture to push our yearly total clean over the 1.25-inch mark. I am starting to wonder about this theory that Midland has some sort of weirdly invisible dome over it ... Like a lot of people Tuesday night into Wednesday morning, I stayed up and watched this massive monster storm descend on us at 40 mph from Lubbock and other points north ... and with seemingly every swipe of the radar the dry spot between the storm over Ector and Andrew counties and a twin storm over Martin and Howard counties grew larger and larger. I don't think we received any rainfall during those wee hours ... and it was strange to watch it all just disappear. It was enough to make you wonder what's going on. As for the photo ... thanks to alert reader Dave Taylor, who captured some great lightning and a storm from the Midland Polo Club Monday. Any seasoned MIdlander would likely conjecture that the rain snapped in the photo is north of the city limits. How 'bout a little wind to go with the miserable cold and dirt today? The wind is up so much our house was actually making a new noise this morning. It often thumps and creaks in the wind, but this morning it sounded like someone was blowing a harmonica through the walls. I sure hope it's still there when I get home from work today. 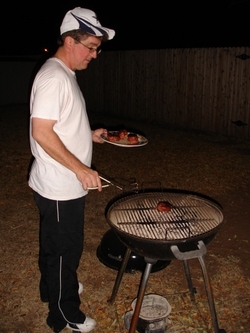 On the 12th Day of Christmas my true love said to me: "Fire up the grill, sweetie, we live in Midland!" "It may be dark, but early January means Grills Up, Baby!" "Midland, Texas: Where we fire up the barbie three weeks before the Super Bowl!" "Baseball? Who needs it. We've got 78 on Wild Card Weekend!" "January in Midland: Feel the warmth." "Charcoal ... Steaks ... and Tulsa vs. Bowling Green in the GMAC Bowl. Only in Midland, Texas"
"It's the Epiphany. Tailgate party, anyone?" "Tefertiller says: Grill today because there's a big change coming: Break out the sweaters Monday because it's dropping to 72!" "Global Warming? I gotcher global warming."